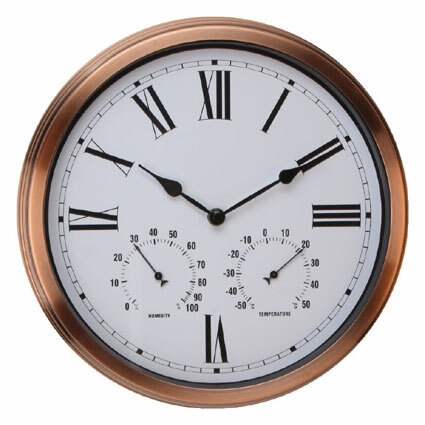 The coppery tones of this wall clock will add a magnificent finish to your outdoor seating, entertainment or patio areas. The round frame encloses a dial with Roman numerals in large bold digits. Simple black dots on a white background mark the hours. Before you plan your next outdoor event, impress the friends by checking both the humidity and temperature on the little dials. This clock is sized at H30 x W30 x D5cm and will make an eye-catching outdoor décor piece.